On February 7, we opened a new exhibition celebrating the art and achievements of romantic couples, from the powerful royalty of the 16th century to cinema stars of Old Hollywood to local artists creating together today. Of Two Minds: Creative Couples in Art and History not only challenges the notion that creativity and authorship are solo endeavors, but shines light on the many different ways these artists lived, loved, and created together. 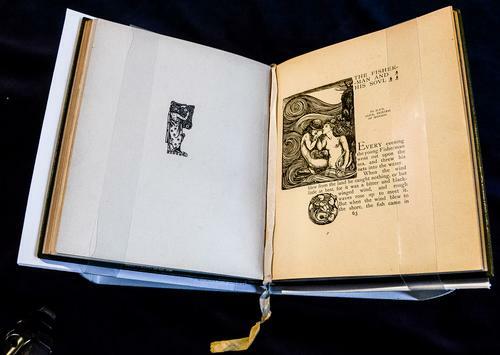 The Rosenbach collaborated with the Free Library of Philadelphia on curating the exhibition, and with contributions from the Children’s Literature Research Collection, Print and Picture Collection, and Rare Book Department, the gallery features work created by romantic couples from the sixteenth century to the present. Some are well-known, like Laurence Olivier and Vivien Leigh, but one of the great pleasures of this exhibition is the chance to explore the stories of couples whose lives aren't so well-known. Among these were Charles de Soussy Ricketts and Charles Shannon, two talented artists who fell in love in art school and spent most of their lives living and creating together. In their London house, The Vale, Ricketts and Shannon made a living from their art: portrait commissions for the painterly Shannon, book design projects for illustrator Ricketts. Eventually they became well-versed in one another's crafts and worked together on projects such as The Dial, an art journal they designed and published, featuring wood engravings they drew and cut themselves. They sent an issue of The Dial to their neighbor, celebrity playwright Oscar Wilde, who admired their work and befriended the pair. After that, Wilde would commission Ricketts and Shannon to design and illustrate nearly all of his books, including The House of Pomegranates depicted here. Ricketts also designed costumes for the stage production of Wilde's Salome, which led to a career in design for the stage and film that lasted the rest of his professional life. The ornate volume of short stories on display in our exhibition was bequested to the Rosenbach by Maurice Sendak; we displayed the beautiful gilded title page in our exhibition Recent Acquisitions from the Bequest of Maurice Sendak last spring. Sadly, the love story of Charles Ricketts and Charles Shannon has a heartbreaking ending. In 1928, Shannon suffered neurological damage from a bad fall from a ladder, and required extensive care until his death in 1937; Ricketts, devastated by his partner's poor health and working ceaselessly to support their household, died of heart failure in 1931. Rather than end this post on a sad note, however, I'd prefer to quote extensively from the memoirs of a friend of the pair. Painter and printmaker William Rothenstein was introduced to Ricketts and Shannon by their mutual friend Oscar Wilde; by his own report, Rothenstein was immediately enamored of the couple, not only because of their artistic talent and success, but because of the enviable life they made together. Rothenstein's memoir paints a beautiful portrait of a home shared by artists in harmony, collectors of fine art, and partners in life. But in those early Chelsea days I was especially attracted by Ricketts and Shannon — they were so different from any artists I had met hitherto. Everything about them was refined and austere. Ricketts, with his pale, delicate features, fair hair and pointed gold-red beard, looked like a Clouet drawing. Half French, he had the quick mind and the rapid speech of a southerner. He was a fascinating talker. His knowledge of pictures and galleries astonished me; he had been nowhere except to the Louvre, yet he seemed to know everything, to have been everywhere. And he knew the names of rare flowers, of shells and of precious stones. Shannon was as quiet and inarticulate as Ricketts was restless and eloquent. He had a ruddy boyish face, like a countryman’s, with blue eyes and fair lashes; he reminded me of the shepherd in Rossetti’s Found. Oscar Wilde said Ricketts was like an orchid, and Shannon like a marigold. Ricketts, in giving his opinions, always said "we." The partnership seemed perfect; there was never a sign of difference or discord; each set off the other, in looks as in mind. From Men and Memories, Vols I and II (1931–32) by William Rothenstein. 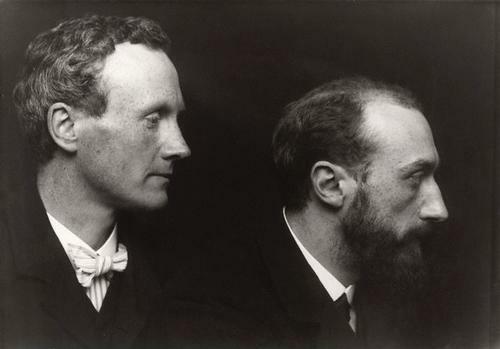 Charles Haslewood Shannon and Charles Ricketts by George Charles Beresford. Photograph, October 1903. National Portrait Gallery. Of Two Minds: Creative Couples in Art & History. On view February 7 - October 7! Oscar Wilde (1854-1900), A House of Pomegranates. Design and Decoration by C. Ricketts & C.H. Shannon. London: James R. Osgood McIlvaine & Co. 1891. Collection of the Rosenbach Harrison 3706. Bequest of Maurice Sendak. Photo by Shaun Hardrick.